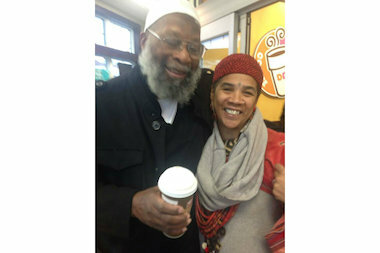 Sekou Odinga gets some coffee with his wife Tuesday morning after being released from prison. HARLEM — A Black Panther who spent the last 30 years behind bars for his role in the deadly Brinks armored car robbery and for trying to kill six police officers during a Queens shootout was welcomed out of prison by family and friends at the National Black Theater Tuesday evening. Sekou Odinga, 70, also known as Nathaniel Burns, a leading member of the Black Panther Party and the Black Liberation Army during the late 1960s, was paroled Tuesday from Clinton Correctional Facility, a maximum security prison in upstate New York. Police arrested Odinga for attempted murder in 1981 after a shootout in Queens with six officers, which investigators believe was related to the robbery of the armored Brinks car. The Oct. 20, 1981 heist at the Nanuet Mall left two police officers and a security guard dead. Odinga was carrying a license plate that had been linked to the Brinks robbery and police officers found a bullet from the gun of one of the officers killed that day, according to media reports at the time. Odinga was also accused of springing fellow BLA member Assata Shakur, who was convicted of killing a New Jersey state trooper, from a New Jersey prison. He was convicted of both crimes in 1984. For friends who think of Odinga as a freedom fighter, Tuesday was a moment of celebration. But for law enforcement officials, Odinga’s release was a bitter pill to swallow. “Society says he has paid his dues, but this reminds me of letting al-Qaida members out of jail and they immediately join ISIS,” said Kenneth Maxwell, former FBI case agent on the Brinks robbery case. Inside the theater Tuesday night, a group of about 40 people waited for Odinga to arrive. There were two chairs and a microphone in the front of the room and several rows of audience seating. “This is a victory to a lot of us,” said Tarik Haskings, who said he spent 17 years in prison for robbing a bank and assaulting two police officers, whom he referred to as "enemy soldiers." Some saw it as a time for reflection, given Monday’s grand jury decision on the Michael Brown case in Ferguson, Mo., which has sparked protests in New York and across the country. “It’s kind of ironic that after a night of rebellion we have one of our soldiers coming home,” Sutton said. Odinga and his family members declined to speak to reporters Tuesday. Members of the audience were asked not to record or take photographs of Odinga’s speech. A reporter was escorted from the theater before Odinga arrived.